Did you know that there are more than 75 different autoimmune diseases? These are diseases like Rheumatoid Arthritis, Lupus, Celiac Disease, Type I Diabetes, and Multiple Sclerosis. An autoimmune disease is one where the body’s immune system attacks healthy cells. They can be painful, exhausting, and confusing. There are many different approaches to managing autoimmune disease flare-ups and symptoms, including autoimmune disease treatment in Ayurveda. In simplest terms, Ayurveda is a 5,000-year-old traditional Hindu system of medicine. It’s based on the idea of balance in bodily systems, and uses nutrition and diet, herbal remedies, and yogic breathing to help treat diseases and symptoms of disease. It treats the root cause of disease rather than the symptoms and has a long history of success. To discover the root cause of autoimmune disorders, Ayurveda looks at what caused the disease in the first place. Generally speaking, autoimmune diseases cause and result in systemic, body wide, inflammation. For example, if you have celiac disease then your body has a systemic reaction to gluten. Your gut becomes inflamed and your immune system is activated. It begins to attack your healthy cells in response. It’s not uncommon for people with celiac disease to lose hair, to experience rashes and skin irritation, and to have major digestive issues. Ayurveda believes that each person has a unique constitution and they classify individuals into three main constitutions or “doshas” – vata, pitta and kapha. Everyone is a combination of all three doshas, but usually has one or two that are dominant. In order to maintain optimal health, and recover from autoimmune disease, you should adhere to food choices and lifestyle choices that help bring your body and health back in balance. Vata Dosha – This dosha is related to the energy that controls bodily functions including blood circulation, breathing, and your heartbeat. Pitta Dosha – This dosha controls your metabolic systems, including your digestion, absorption, nutrition, and your body’s temperature. Kapha Dosha – This dosha controls growth in your body, manages fluid balance, and your immune system. With an autoimmune disease, most often the Pitta dosha is out of balance. This means autoimmune disease treatment in Ayurveda would look at rebalancing your digestion, absorption, and nutrition. It would likely recommend calming the mind and body through meditation. And it would generally focus on embracing a Pitta diet that reduces sour and salty foods and increases foods with sweet and astringent tastes like green leafy veggies, lentils, and green tea. You may also expect an Omega-3 fatty acid enhanced diet or supplementation to be recommended to reduce inflammation. Ayurveda was created thousands of years ago and is still practiced today. 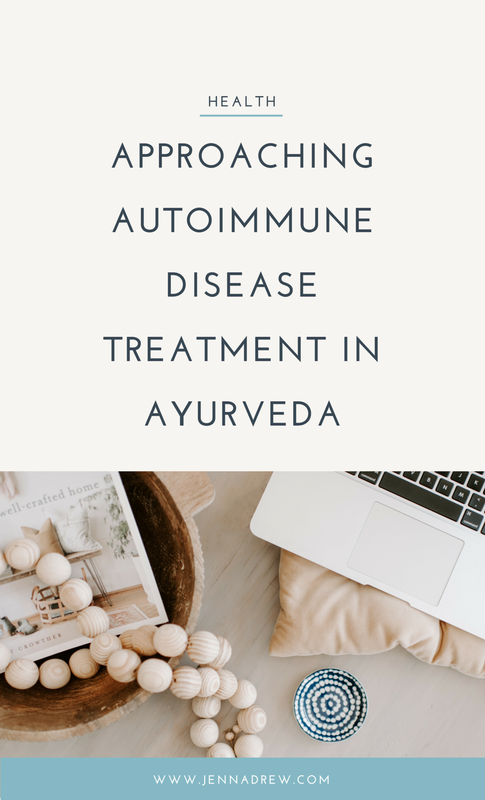 When it comes to managing an autoimmune disease and symptoms, the Ayurvedic healing approach is a generally safe one and one that is easy to embrace. Autoimmune disease treatment in Ayurveda means feeling better the natural way.